The Ship is an institution in the Singapore dining scene, having been around since we were very young. In the days when dining options were not so varied as today and Western dining cuisine usually meant sky high pricing, we were grateful to have places like Jack’s Place and The Ship where the word “affordable” could be mentioned in the same breath. After being closed for quite a while due to the renovations at Shaw Centre, we looked forward with anticipation to the reopening of The Ship. Upon entering the restaurant, the physical changes were obvious. The once dark and intimate mood has been transformed into a colourful and bright atmosphere. The nautical theme is everywhere. The next change that hit us was when we read the menu. 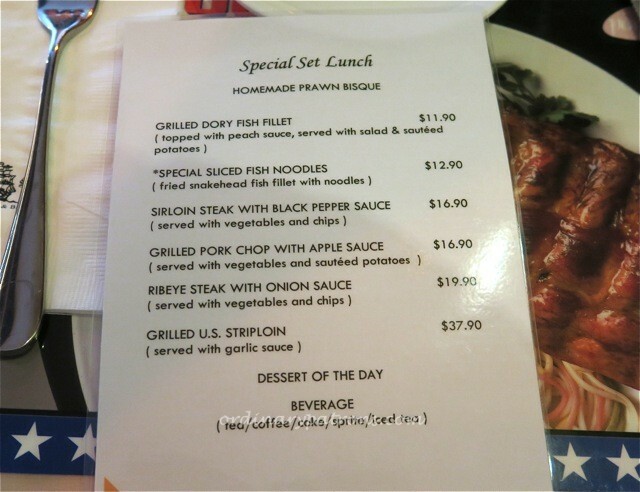 Apart from the main menu there were two set lunch menus. We can’t remember the old prices but our hunch is that prices are not what they used to be. OK, we must allow for inflation and maybe the food has also been upgraded, we consoled ourselves. 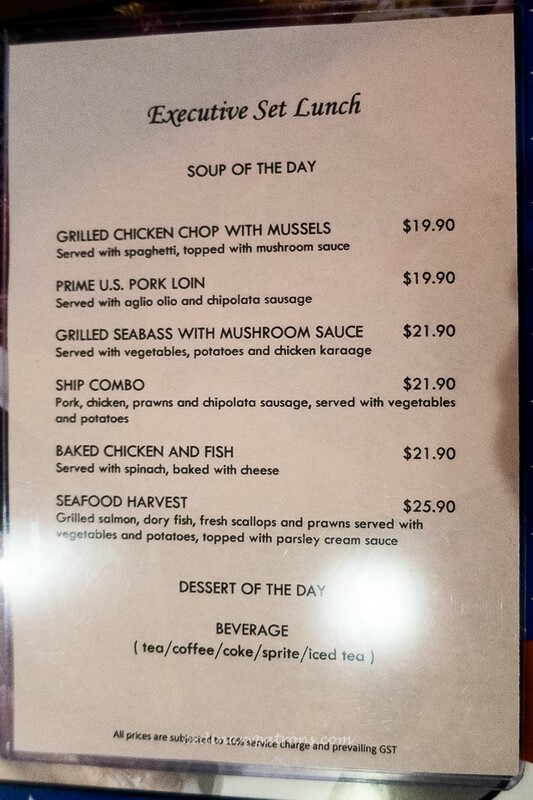 We ordered the three set lunches – Sliced Fish Noodles ($12.90 and the only local dish available), Grilled Ribeye Steak ($19.90) & The Ship Combo ($21.90) – and the Chicken Maryland ($16.90) and Crepes Suzette ($10.90) from the ala carte menu. The consensus was that this was not the Ship that we had memories of. Each of the dishes were competently done. But they were ordinary and you could get them anywhere. Maybe the change of atmosphere had affected the dining experience or perhaps the increased prices had sub-consciously raised our expectations. Or it could be teething issues; the restaurant was packed (probably with similar nostalgia filled ordinary patrons) and the staff were obviously short-handed. Our crepe suzette was forgotten and came after we asked about its status. We refused to let our fond memories be dulled by a one-time experience. But even we, stubborn romantics, could not keep up the faith when the desserts for the set lunches arrived. Here it is. So sad. I loved the old ship. Hopefully they will improve.